Even Colorado natives can learn new tricks and tips for driving safer on snow and ice. Typically, Colorado natives will look down their nose at those who come from warmer climates, offering up whatever advice they can to be better drivers in the snow. 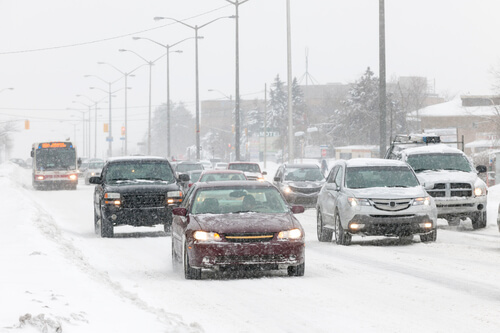 We’ve taken a look at what the experts have had to say about driving on snow and ice, and we’ve compiled a nice list of the top wintertime driving tips. Avoid driving while fatigued. Studies have shown that driving fatigued can result in driving risks similar to those who are impaired by alcohol. Never start your car in an enclosed area and let it run to warm up, like in a garage. This can create a deadly buildup of carbon monoxide, which can kill a person without warning. Always make sure your tires have enough tread and they are properly inflated. Always have about a half tank of gas in your car. Avoid using the parking break as a handbrake on snow and ice. Don’t use the cruise control function when driving on snow, ice and wet surfaces. If you lose traction on snow or ice, steer in the direction you want to go. Put your seat belt on every time you get into your vehicle. Make sure your windshield wipers are in good working condition, and your wiper fluid is topped off. Pack extra warm clothing (gloves, hats, coats, and a blanket), food, water, and emergency kit in your vehicle in the event you get stranded. Don’t hit the gas when you want to start going anywhere or make a turn. Accelerating too fast can cause your tires to lose traction. Don’t hit the brakes when you want to stop right away. Pump your brakes, so you don’t lose traction. Holding your foot on the brake will just lock up your brakes and cause you to skid. Drive below the posted speed limit if weather conditions are degraded. Everything takes longer on snow-covered roads (stopping, turning, breaking, etc.). The average follow time of three to four seconds should be increased to eight to 10 seconds to account for the increased margin of difficulty in driving. If you have been injured in a wintertime car accident through no fault of your own, you can turn to an experienced and reliable Denver Car Accident Attorney at Bell & Pollock, P.C. who will successfully build your case and see it through the legal process for the best possible outcome. At Bell & Pollock, our lawyers are seasoned veterans who aggressively litigate cases for victims of negligence with superior legal representation to help them maximize their financial recovery. Since 1984, our attorneys have been standing up to those who are negligent in personal injury case, and have helped victims so they can recover the maximum compensation owed to them under the law. Let our talented and professional lawyers provide you the options available to you, so you can pursue the financial, emotional, and physical recovery you deserve to get your life back on track. To find out more about how we can help you, call us at (303) 795-5900 or email our firm using the contact form on this page to schedule a no-cost, meet and greet with one of our lawyers. We are conveniently located in Denver, Greenwood Village, and Steamboat Springs, so we can service those in all reaches of Colorado. 1“Driving Instructors Provide Winter Weather Driving Tips” published in Denver 7 News, January 2017.